The New York Times best seller now available in a trade paper edition! 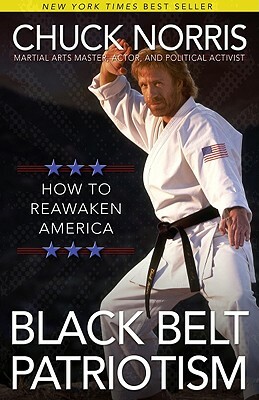 Chuck Norris says, "Black Belt Patriotism is my critique of what is destroying our country, and offers my solutions for rebuilding America and restoring the American dream. It's 'black belt' in the sense that it is strong, resolute and to the point, like a roundhouse kick. It's 'patriotic' in the sense that it recaptures the vision of America's Founding Fathers. I wrote this book in the hope that future generations of Americans can continue to enjoy life, liberty, and the pursuit of happiness . . . .
Chuck Norris is a legendary film and televison actor best known for his popular series Walker, Texas Ranger, now in sydication to millions worldwide. He is also a martial arts expert, an active humanitarian and founder of KICKSTART, and author of the New York Times best-selling autobiography Against All Odds. Norris also writes a column that appears in Human Events, Town Hall, and World Net Daily, among other outlets. He lives with his wife Gena and their children near Houston, Texas.